Nevada County, Calif. April 12, 2019 – In an unprecedented collaborative effort the Fire Safe Council of Nevada County, with support from County of Nevada Office of Emergency Services and Waste Management, is offering free residential green waste disposal options for the month of May. The Fire Safe Council of Nevada County fulfills its mission by providing various alternatives such as the drive-by chipping program and community green waste drop sites. “The Fire Safe Council is very excited to be offering our first multi-location Residential Green Waste Disposal Program throughout the month of May. We want to encourage and aid the residents in our community in their efforts to prepare for this year’s fire season. This program continues our mission of helping residents with fuel reduction projects and defensible space around their homes. We hope that these free drop sites funded by our California Fire Safe Council Grant, will make this task a little easier for everyone to achieve this year,” says Executive Director, Jamie Jones. Beyond offering the convenience of more sites and economic relief with free options, this program provides an opportunity to connect with neighbors around this important issue. “The free green waste disposal program provides a wonderful opportunity for neighbors to work together and create defensible space as a community,” adds Richard Anderson, chair of the Nevada County Board of Supervisors. 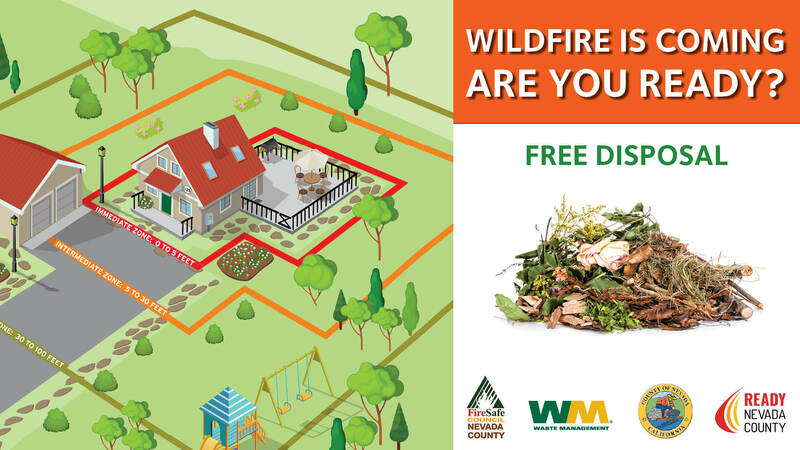 Fire Safe Council is seeking to fill more than one hundred volunteer shifts at six green waste disposal locations throughout Nevada County. Participants using the green waste sites will be asked to fill out a brief questionnaire before unloading. Volunteers will help monitor materials being dropped, and track time residents spend developing defensible space around their homes. This tracking, known as volunteer match, helps ensure the continued funding of such events. Residents interested in volunteering may register online at: www.MyNevadaCounty.com/GreenWaste. This program is designed for residential green waste only, and participants are responsible for unloading their own vehicles. Dumpsters will be available for depositing green waste. Acceptable items include: biomass consisting of all tree and plant trimmings, dead plants, weeds, leaves, branches, and similar materials that fit into a Green Waste Cart. Please note, items with a diameter greater than 6 inches, tree stumps, root balls, and household waste will not be accepted. For information and assistance in creating Defensible Space for your home contact the FSCNC at 530-272-1122 or www.areyoufiresafe.com.